Polls this week suggest support for the NDP may be slipping, largely driven by softening numbers in British Columbia and Ontario. They also show the Conservatives in third place. Is it a mid-campaign blip, or a real trend? Two new polls — published after the EKOS survey discussed below — continue to show weakening numbers for the New Democrats. But they also show the Conservatives in third place. A Léger poll published in the Globe and Mail on Friday put the New Democrats at 31 per cent, followed by the Liberals at 30 per cent and the Conservatives at 28 per cent. It had the NDP down marginally, but recorded larger drops for the party in Ontario and British Columbia. Léger's previous poll already had the Conservatives in third, so the order of the parties has not changed in this survey. The same goes for a new Forum Research poll published in the Toronto Star on Saturday. The poll put the NDP in front with 36 per cent, with the Liberals at 32 per cent and the Conservatives at 24 per cent. Here again, the order of the parties did not change, and the Liberals and Conservatives both had an uptick that was within the margin of error, but the New Democrats were down four points from where they stood the week before. As a result of adding these two new polls to the Poll Tracker, the Conservatives are now in third place behind the Liberals and the NDP in both projected support levels and likely seat wins. The comfortable lead the New Democrats were enjoying in the polls is shrinking. 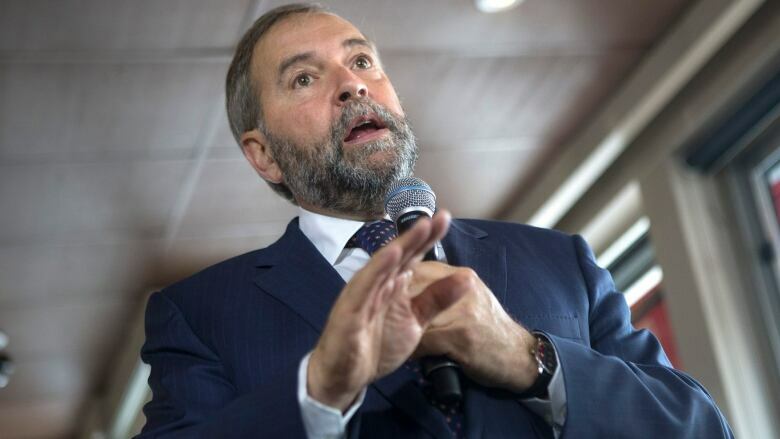 Is it a mid-campaign blip, or a new trend that could see the NDP lose its front-runner status? A new poll by EKOS Research published Friday suggests the NDP is losing steam, dropping 3.4 points since its previous poll from the week before. The NDP was still in front in this poll, as it has been in every poll conducted entirely after the Aug. 2 campaign kick-off, with 30.2 per cent support, versus 29.5 per cent for the Conservatives and 27.7 per cent for the Liberals. But the slip was outside of the margin of error, and has been echoed in some other surveys. The next most recent poll published earlier this week, by Abacus Data, had the NDP down four points. The CBC Poll Tracker, which heavily weights the newest EKOS poll (as it has a large sample and is the newest survey in a week that has been relatively quiet on the polling front), has the NDP in front with 31.2 per cent support. The Conservatives follow with 29.4 per cent, the Liberals with 27.7 per cent and the Greens with 6.1 per cent. The Bloc Québécois stands at 16.7 per cent support in Quebec. Though the NDP is still first in the polling average, the margin of 1.8 points between it and the Conservative Party is far smaller than the 9.3-point gap that it had in polls conducted up to Aug. 24. The tightening race has cost the NDP its advantage in the seat projection, as it has now dropped to an average tally of 117 seats to 124 for the Conservatives. But the two parties still overlap a great deal, leaving the outcome, if an election were held today, little better than a coin flip. NDP slipping in Ontario and B.C. The softening NDP numbers seem to be largely driven by recent shifts in British Columbia and Ontario. With polls in the field to Aug. 24, the NDP had 39 per cent support in B.C. in the Poll Tracker, but has since dropped to 32 per cent. The 12-point lead it had over the Conservatives in the province has dropped to two. In the last five polls published in the province, the NDP has scored only between 31 and 33 per cent. In the five polls prior to those, the NDP was scoring between 38 and 41 per cent support. Numbers from EKOS, Abacus, Nanos Research, and Ipsos Reid have all shown drops for the NDP in B.C. This is problematic for the New Democrats, as the province is, along with Quebec, a key to forming government. The polls in Ontario are also souring for the New Democrats, with four consecutive surveys putting the party under the 30 per cent mark. As of Aug. 24, the poll average was giving the NDP 34 per cent in Ontario. The party's score is now 28 per cent. Neither the Conservatives nor the Liberals alone have benefited from this slip, which explains why neither party has been able to overtake the New Democrats countrywide. The Conservatives and to a lesser extent the Greens have taken advantage of the NDP's weakening support in B.C., while in Ontario the Liberals have been the major beneficiary. It remains to be seen whether this is a temporary and ephemeral shift in voting intentions. More data over a more prolonged period of time is needed to confirm if this is a real trend. But, for Tom Mulcair and the New Democrats, maintaining the lead in a three-way race while every party turned its sights on them was always going to be difficult. If the NDP can withstand the pressure and hold its lead, it could be a good indicator of whether or not the New Democrats have the staying power to prevail in this lengthy campaign. EKOS: "If the federal election were tomorrow, which party would you vote for?" Forum: "If a federal election were held today, which party are you most likely to vote for?" Léger: "If FEDERAL elections were held today, for which political party would you be most likely to vote?" Election Pollcast: Is the economy the ballot box issue? Will British Columbia decide the election's outcome?